Klasmann-Deilmann com­mis­sio­ned and con­duc­ted a stu­dy that invol­ved moni­to­ring of emis­si­ons from peat­land over a two-year peri­od in accordance with sci­en­ti­fic cri­te­ria. It emer­ged that raw-mate­ri­als extrac­tion results in a con­si­der­a­b­ly smal­ler quan­ti­ty of green­house gas emis­si­ons per annum than assu­med so far. The figu­re for average emis­si­ons that the com­pa­ny had pre­vious­ly used, based on data from the lite­ra­tu­re, was 10.73 t CO2e per hec­ta­re, per annum. In actu­al fact, howe­ver, the mean annu­al emis­si­ons asso­cia­ted with black peat are 3.13 t CO2e per hec­ta­re; tho­se asso­cia­ted with white peat are 8.05 t CO2e ha-1 a-1. In recent years, the­re has been an over­lap bet­ween – on the one hand – the dis­cus­sion on emis­si­ons­from the extrac­tion and use of peat and – on the other – the con­ser­va­ti­on-rela­ted deba­te on the pre­ser­va­ti­onof peat­land. The­re is agree­ment that the pro­duc­tion and usa­ge of peat cau­ses signi­fi­cant emis­si­ons. Until recent­ly, howe­ver, direct mea­su­rements of green­house gases from sites actively uti­li­sed for peat extrac­tion had not taken place. The­re­fo­re, state­ments on the cli­ma­te impact of peat extrac­tion are­as had to be deri­ved from the out­co­mes of moni­to­ring on peat­lands used for other pur­po­ses, and from model assump­ti­ons. And, pre­vious­ly, the assu­med figu­re for average emis­si­on levels that Klasmann-Deilmann fac­to­red into its own car­bon foot­print was 10.73 t CO2e per hec­ta­re, per annum. Against this back­ground, the com­pa­ny initia­ted a stu­dy on emis­si­ons deri­ved from peat extrac­tion and, bet­ween Febru­a­ry 2015 and Febru­a­ry 2017, con­duc­ted green­house gas mea­su­rements on our white-peat and black-peat extrac­tion are­as. 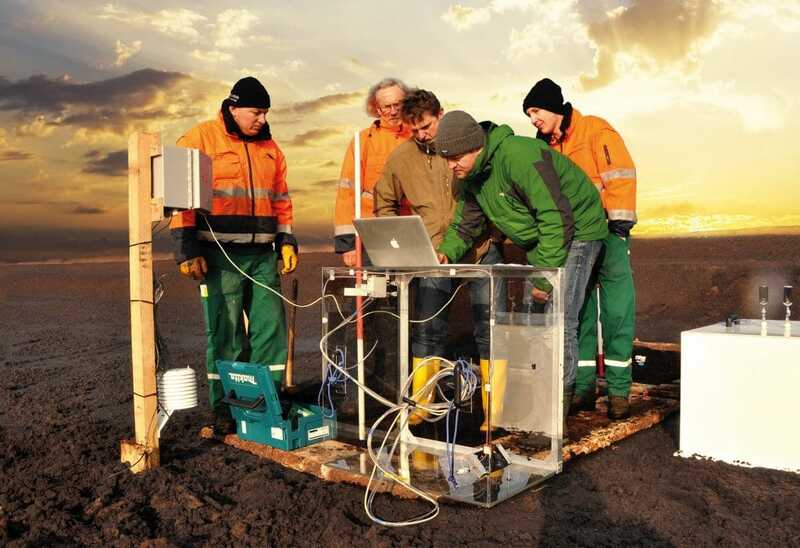 The aim was to clo­se the exis­ting gap in the sci­en­ti­fic data and to pro­vi­de reli­able infor­ma­ti­on about emis­si­ons from the extrac­tion and use of peat. Klasmann-Deilmann was assisted, in both the moni­to­ring cam­pai­gns and in drawing up the foot­print, by the Colo­gne-based Meo Car­bon Solu­ti­ons GmbH. Experts from Meo, the Mün­che­berg-based Leib­niz Cent­re for Agri­cul­tu­ral Land­s­cape Rese­arch (ZALF), the regio­nal Sta­te Agen­cy for Mining, Ener­gy and Geo­lo­gy (LBEG) in Hano­ver, the Ger­man Rese­arch Cent­re for Geo­sci­en­ces (GFZ) in Pots­dam, and the Kiel Insti­tu­te for the World Eco­no­my (IFW) con­fir­med that mea­su­rements and foot­prin­ting activi­ties under this pro­ject yield valid out­co­mes and meet sci­en­ti­fic cri­te­ria. Based on the results of the­se emis­si­ons mea­su­rements, average emis­si­ons per hec­ta­re, per annum (i.e. CO2e ha-1 a-1) are con­si­der­a­b­ly lower than was pre­vious­ly assu­med. The mean emis­si­on levels deter­mi­ned for the black-peat extrac­tion area used for moni­to­ring in Ger­ma­ny were 3.13 t CO2e ha-1 a-1. On the white-peat extrac­tion site in Lit­hua­nia, moni­to­ring revea­led average emis­si­ons of 8.05 t CO2e ha-1a-1. Thus, mine­ra­li­sa­ti­on of both black and white peat, and asso­cia­ted emis­si­ons, occur­red to a les­ser extent than pre­vious­ly esti­ma­ted.